So Apple finally caved and let Google Voice back into the iPhone App Store. Now, what do you do with it? Making your Google Voice number the primary way to reach you brings the most advantages, but also requires the most commitment. I'll assume you already have a Google Voice number, but if not, get one here. Make sure to add your existing cell phone number under "Settings > Phones." You don't have to throw away your existing cellphone number, but when you make calls from the Google Voice app, the person you're calling will see your Google Voice number. You might want to let your contacts know that you have a new number and will be calling and texting from it. Disavow the iPhone's "Phone" and "Messages" apps -- fling them to the far end of your home screen, perhaps -- and start using Google Voice as your communications hub. Now that Google Voice is a native app, you'll get push notifications when a text message or voicemail comes in. Texting is free through Google Voice, and you can send messages from the dialer or by tapping any contact name and selecting "text." Your history of messages is under the "Inbox" section. Once your friends and family get the gist and stop texting your old number, you can ditch that unlimited messaging plan, with one caveat: Google Voice doesn't do MMS, so if you send a lot of photos and videos, you'll still want a plan from AT&T. As for phone calls, you won't save any money by making domestic calls with Google Voice on your cellphone, but if you set up Gmail calling on your computer, you can cut down on voice minutes. First, install Google's voice and video chat plug-in on your computer. Then, go to your Google Voice settings and check off "Google Chat" under the "Phones" tab. Now, when someone calls your Google Voice number, your computer will ring. Answer on the phone, and it's free for US calls. 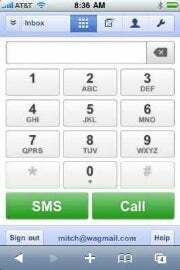 The Google Voice iPhone app doesn't give you a lot of call management options, so you should adjust those settings from the Google Voice website. Under "Voicemail and Text," you can record a greeting and a name, specify whether you want e-mail or text notifications for voicemails, or e-mail notifications for text, add a voicemail PIN number and get voicemail transcriptions. The "Calls" and "Groups" tabs are where Google Voice's call management power comes in. You'll have to manually add contacts to groups, but once you've done that, you can set up personalized greetings and decide whether to screen their calls before answering. Under the "Calls" tab, you can decide whether to screen calls from unknown numbers and set up a "Do Not Disturb" period, during which calls will go straight to voicemail. If you don't have access to a computer, you can adjust some of these settings from google.com/voice. If you own a business or work from home, Google Voice is useful for separating work and personal communication. You might consider giving your Google Voice number to business contacts only, and treating Gmail calls as an office phone. That way, call screening and "Do Not Disturb" mode will only apply to work contacts. Should you go this route, check out the advanced call management on Google Voice's desktop website. Go to the "Phones" tab and click "Edit" under your mobile phone number, then click "Show advanced settings." From here, you can choose not to ring your cellphone on the weekends, or set up a custom ring schedule. I shouldn't neglect to mention Google Voice's international calling features. Here are the rates, compared to the rates for Skype. The nice thing about using Google Voice, however, is that your contact will see your Google Voice number on caller ID. And when that person calls the number back, you only consume voice minutes on your phone.